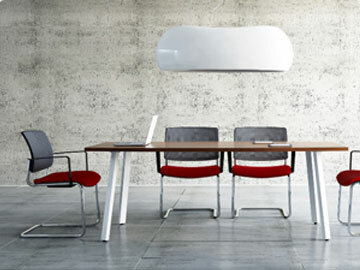 Desks are incredibly useful pieces of furniture and no home – and definitely no office – is really complete without one. You may have an image in your mind of exactly what it means when someone mentions ‘desk’ but did you know that there are many different types of office desks available, each one suitable for something slightly different? Having said this, here is our quick guide to some of the most popular. A writing desk is ideal for those who like things plain and simple. These flat, open desks are perfect spaces to place a notepad and pen or perhaps a laptop. They can be placed against a wall or in the corner of a room. They could even go in the centre of a room if that was what was called for. The point is, a writing desk is supremely versatile and, just because it is called a writing desk, you can do any kind of work on it. Many people now have offices at home because they either work from there or because they need somewhere permanent for a desktop computer to be stored. The computer desk is ideal for placing in a home office. You’ll have plenty of space for the computer itself plus the monitor, and there will be storage space for paperwork and software. There is also usually a dedicated tray for your keyboard and mouse. If you need to place a printer, scanner, or other office accessories on the desk, then of course you’ll need to ensure that it is big enough. One of the major benefits of a computer desk is that you can tidy away the dangling cables, keeping them neat and out from under your feet. Standing desks, also known as height adjustable desks, are becoming more and more popular in the modern office. We know it’s not good for us to sit in one place for hours at a time, and we know that the medical wisdom is that we get up and move around as much as we can. However, that’s not always possible, especially when there is a big deadline looming. A standing desk can prevent the necessity of having to keep moving around and that means you can be more productive. Standing is much better for your health than sitting, so it makes sense to have a desk at which you can do your work standing up. Executive desks are big. That’s the first thing that most people will notice about them. Although they are big, they are also easy on the eye. They are going to take up a lot of space, so they just don’t work in a small office (or even a shared office where most of the office desks are standard computer or writing desks – an executive desk would look very out of place). These desks are usually made of carved wood; they are big and they are bold and they evoke a definite sense of grandeur. One of the best things about these desks is the amount of storage that you get with them. There are so many drawers, perhaps even small cupboards too, that you can keep the rest of your office looking neat and tidy and keep all the bits and pieces in your massive executive desk. Secretary desks serve a number of useful functions, much like a secretary in an office does. These desks have a hinged surface with a bookcase above it. This bookcase is often, but not always, complete with doors so that the whole thing can pack neatly away when it is not being used, saving you space in the process. If you like this quick guide on office desks but are still unsure which one is best suited to your needs, why not give us a call on 01 461 0300.